Amadeus Lee had long thought that policymakers were politicians. "I assumed they were the same thing, and that it involves making laws for the country," said the Secondary 3 student of Xinmin Secondary School. But policymakers actually refer to public servants - people in the ministries and statutory boards - and they do not make laws. The 15-year-old found out about this just last month, during a programme that exposes him to the work that policy officers do. The programme, by non-profit organisation The Apprenticeship Collective (TAC), runs every Saturday for six weeks until Nov 18. It is meant to give students a glimpse of the motivations and skills needed for certain professions. TAC partners schools and ropes in professionals to mentor students and guide them in a project. We asked ourselves - what can we do to help them discover that passion earlier, so that they need not have 'suffered' or 'wasted those years'? Our answer was to give students opportunities in a relatively low-stakes environment to try different jobs, with the intent of discovering what type of work they enjoy, what they don't enjoy, and most importantly, the reasons why. MR WONG YI FONG, a co-founder of The Apprenticeship Collective, on people who do not enjoy what they study in school and who end up dreading their jobs. 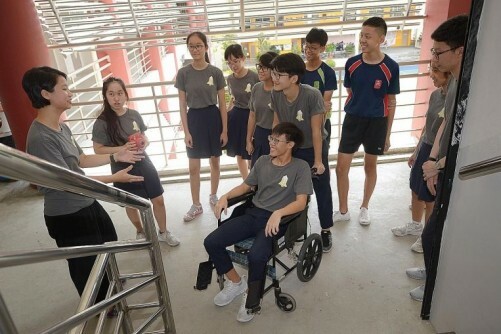 It started with Peicai Secondary School in 2015 and since then,TAC has mentored more than 500 students from Loyang Secondary, Chong Boon Secondary, Bukit Panjang Government High and Xinmin Secondary. It has covered more than 25 jobs such as computer programmer, urban farmer, aerospace engineer, journalist and film-maker. One of TAC's co-founders, Mr Wong Yi Fong, said it includes jobs that are not widely known so that students can see the range of opportunities and choices available. TAC was founded in 2014 by a group of university friends who had noticed that some people did not enjoy what they had studied in school and ended up dreading their jobs. Said Mr Wong, a 31-year-old geography teacher: "We asked ourselves what can we do to help them discover that passion earlier, so that they need not have 'suffered' or 'wasted those years'? "Our answer was to give students opportunities in a relatively low-stakes environment to try different jobs, with the intent of discovering what type of work they enjoy, what they don't enjoy, and most importantly, the reasons why." Mr Wong said they hope students can make better-informed choices instead of letting their grades or perceived notions of success in society dictate what they should do. TAC is one of the 118 industry partners that the Ministry of Education (MOE) works with to provide schools with current industry information and experiences. Amadeus, one of 92 students from his school attending the programme, said he learnt about the process of coming up with policies. "One decision can affect another and we need to consider different viewpoints," he said. "For example, many students want school to start later. But there are also consequences to consider - maybe school might end later and parents would have to make alternative arrangements to pick up their children." His schoolmate Celest Sim said: "I wanted greater exposure to the adult work life because I have to choose which course to take next year after O levels." The 15-year-old is learning about community innovators, people who work on solutions to issues in the community, such as ageing, urban living and food wastage. One of her tasks was to cycle around Coney Island to look out for problems that cyclists may face. "We took photos of problems such as the lack of infrastructure like toilets and water coolers, and our mentors probed us to think of solutions." Other industry partners include professional network LinkedIn, which started working with schools this year to help education and career guidance counsellors guide students on using its platform and making sense of its reports on hiring trends in Singapore and the region. The counsellors help students to use LinkedIn to build their networks, connect to job and education opportunities, or even start their own companies in the future. Another industry partner is local video game start-up Witching Hour Studios, whose co-founder and creative director Ian Gregory has visited nearly 10 schools to share his experience as a game designer. The 32-year-old took an unconventional route himself. After secondary school, he took on jobs fixing computers and doing freelance creative work before going to Nanyang Academy of Fine Arts to study advertising at 23. He said: "Instead of waiting for some ray of light to hit you, be curious and poke at anything that's moderately interesting. It's a good way to find nooks and crannies that average people miss." A version of this article appeared in the print edition of The Straits Times on November 06, 2017, with the headline 'Helping students discover passion and pick right career'.